Ready for your winter vacation ? You found the perfect hideout to enjoy your holiday, Amoreto-Roman's House is a romantic house with a separate little cottage, favorite destination for couples or couples with young children. But also for family or friends groups of up to six or more . It is located in the very heart of Tuscany with a big fireplace for cold days, private pool for hot days and huge surrounding gardens. There is an queen size orthopedic canopy bed, a sofa bed, children's cribs or cots are available upon request. The main house has two more double occupancy bedrooms . There's a large fireplace, outside fire oven, outdoor BBQ, kitchen and bathroom with shower. The outside patio has a view of the spacious above ground pool -12 meters by 6 meters -and the surrounding gated grounds. 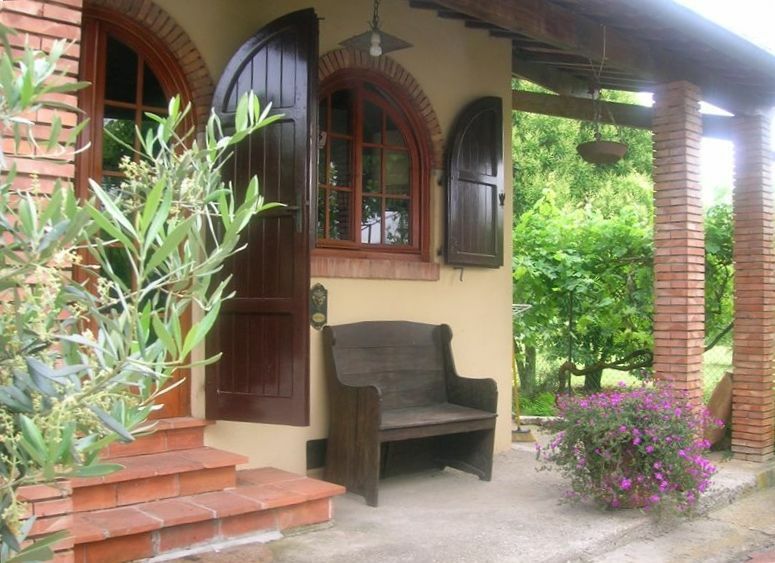 Because of his privileged location, this property is ideal for vacations all year round, both for those who want to spend a quiet time in the green of the hillsides, and for those who want to maximize their stay with lots of sightseeing and fun activities. The Property is situated at about 8 Kilometers from the walled city of Lucca, nicknamed "Sleeping Beauty" by the English. Poets such as Byron and Shelley elected to spend there many magic moments. Lucca is a destination for Opera aficionados, being the birth place of composer Giacomo Puccini (Madama Butterfly anyone?). Also close are Pisa, with its world famous leaning tower, and Florence with its art treasures. The beach area of Versilia, famous for its sandy beaches, but also for its glamour and night life, is about 35 minutes drive west of the cottage. Also close is the Chianti region with its vineyards and wine tasting opportunities. Horseback riding, spelunking, mountain climbing...really too many are the amenities to be able to describe it all in this short space! The cottage was built my my dad in 1972 as a dependence to the main house that was built in 1960. I remember as a young child, helping the workers who were laying the bricks for the cottage by running little errands for them. They even let me pose the bricks, on special occasions, guiding my child's hand. I remember how heavy the brick felt for me and how it would make the cement gush out like cream cheese out of a sandwich. That's me in the picture, with my sun hat, pruning the bushes on the property. By renting this property you will not only enjoy a splendid vacation in bucolic surroundings, you will be close to main historical sites such as Lucca , Pisa and Florence, the beaches of the Viareggio Riviera and the majestic mountanous peaks of the Alpi Apuane. You will be a guest in my family home and you will help me keep and restore the grounds for many more years to come . There is always a lot to do on the property and after a few years where I could not manage it , I am finally taking it back in my hands to give it , with your help, the love and attention it deserves. I am in love with the peace and quiet and the green surrounding this place. I love floating in the pool or reading a book in the backyard. And I love that I can jump in the car or catch a bus and be at the beach , or downtown Lucca catching an event or visiting a museum, or hop on a train and be in Rome in less than 2 hours. Roman's House with its bucolic surroundings is perfect for romantic walks in the woods and hills, close to beach areas for summer activities, 1 hour away from the closest ski area, search for mushrooms in Garfagnana!, climb the Pania mountain, scout the Chianti region for wine tasting, dance all night in the Capannina or the Cannuccia or other exclusive night clubs of the Versilia region, shop in the nearby shopping centers, or enjoy the simple life of a countryside romantic hideout.